The 70 acres of Windsor Green's Central Florida luxury real estate is being divided into 29 lots for building more multi-million-dollar homes. The centerpiece of the Windor Green development is a gorgeous, breathtaking two-story mansion with gold-hued, stuccoed walls, second-story parapets and stone tower which sits on 3.5 wooded acres on a back road in Lady Lake. Make your luxury home in The Villages and Central Florida. According to the Lake County Property Appraiser's records, there are close to 40 homes valued at more than $1 million in the county, with the highest valued at $6.5 million. 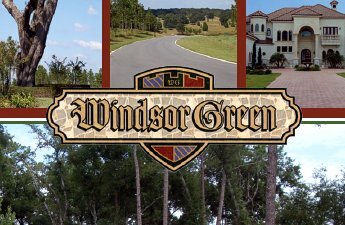 For investors looking for outstanding values in Central Florida real estate, Windsor Green Homes is waiting for you. Call us today at (352) 299-0177 to discuss a tour of the luxurious Central Florida real estate value. Oral representations cannot be relied on as correctly stating representations of the Developer. For correct representations, make reference to the purchase and sale agreement and the documents required by Florida Statute 720.401 to be furnished by the Developer to a buyer. Drawings are conceptual only and are only for the convenience of reference. They should not be relied upon as representations expressed or implied of the actual dimensions of the property. The Developer expressly reserves the right to make modifi cations, revisions and changes it deems desirable in its sole and absolute discretion. Obtain the purchase and sale agreement and documents required by Florida law before signing anything. No federal or Florida agency has judged the merits or value if any of this property. Award Winning Winner of the prestigious 2007 Parade of Homes. The first home to ever receive a perfect score in 19 years. Central Florida's most Elegant and Beautiful homes. Investment Opportunities Invest in Florida real estate. Outstanding investment for UK and Great Britain investors looking to take advantage of the US Dollar. © 2013, RCR Development Group, LLC | Developer | All Rights Reserved.